Paleontologists announced the discovery of a dinosaur-like animal that lived 240 million years ago — about10 million years earlier than the oldest known dinosaurs. This suggests that dinosaurs and close relatives such as pterosaurs (flying reptiles) originated much earlier than scientists previously thought. The research also suggests that at least three times in the evolution of dinosaurs and their closest relatives, meat-eating animals evolved into animals with diets that included plants. These shifts all occurred in less than 10 million years, a relatively short time by geological standards. The description of the new species Asilisaurus kongwe (a-SEE-lee- SOAR-us KONG-way) appears in the March 4, 2010 issue of the journal Nature in a paper lead-authored by Sterling Nesbitt, a postdoctoral researcher at The University of Texas at Austin's Jackson School of Geosciences. A co-author of the paper was Kenneth D. Angielczyk, assistant curator of paleomammology at Chicago's Field Museum. Asilisaurus is part of a sister group to dinosaurs known as silesaurs. Silesaurs are considered dinosaur-like because they share many dinosaur characteristics but still lack key characteristics all dinosaurs share. The relationship between silesaurs and dinosaurs is analogous to the close relationship of humans and chimps. Even though the oldest dinosaurs discovered so far are only 230 million years old, the presence of their closest relatives 10 million years earlier implies that dinosaurs and silesaurs had already diverged from their common ancestor by 240 million years ago. Silesaurs continued to live side by side with early dinosaurs throughout much of the Triassic (between about 250 and 200 million years ago). This is the first dinosaur-like animal recovered from the Triassic of Africa. Fossil bones of at least 14 individuals were recovered from a single bone bed in southern Tanzania making it possible to reconstruct a nearly entire skeleton, except portions of the skull and hand. Kenneth D. Angielczyk, of The Field Museum, helped discover and excavate specimens found in Tanzania. "We brought many of the specimens back to Chicago where Field Museum paleontologists cleaned and conserved them in the Museum's fossil preparation labs," explained Angielczyk. 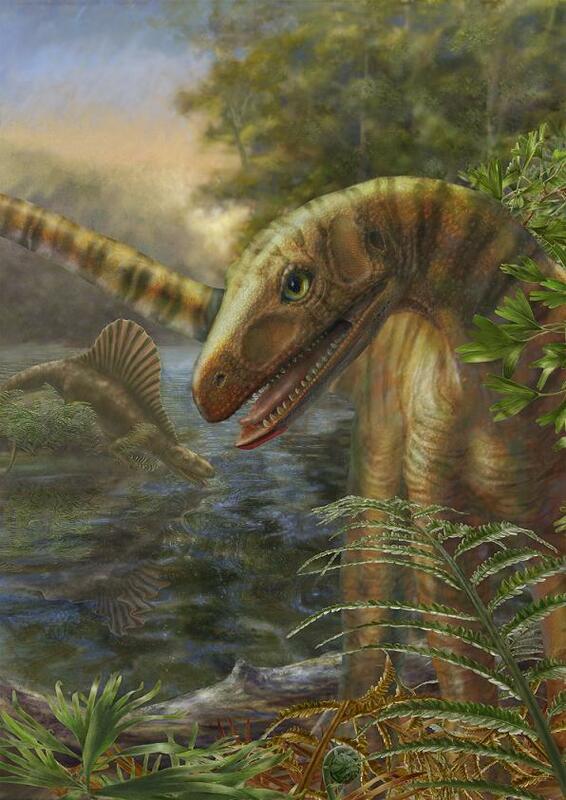 Asilisaurus walked on four legs and most likely ate plants or a combination of plants and meat. They stood about 0.5 to 1 meter (1.5 to 3 feet) tall at the hips and were 1 to 3 meters (3 to 10 feet) long. They weighed about 10 to 30 kilograms (22 to 66 pounds). Silesaurs have triangular teeth and a lower jaw with a beak like tip which suggest that they were specialized for an omnivorous and/or herbivorous diet. These same traits evolved independently in at least two dinosaur lineages. In all three cases, the features evolved in animals that were originally meat-eaters. Although difficult to prove, it's possible that this shift conferred an evolutionary advantage. An ecosystem can support far more plant eaters than meat eaters. So being able to eat plants might have opened up a broader range of habitats. Not counting modern birds, dinosaurs survived for about 180 million years. This new species is found along with a number of primitive crocodilian relatives in the same fossil bed in southern Tanzania. The presence of these animals together at the same time and place suggests that the diversification of the relatives of crocodilians and birds was rapid and happened earlier than previously suggested. It sheds light on a group of animals that later came to dominate the terrestrial ecosystem throughout the Mesozoic (250 to 65 million years ago). "Everyone loves dinosaurs," said Nesbitt. "But this new evidence suggests that they were really only one of several large and distinct groups of animals that exploded in diversity in the Triassic, including silesaurs, pterosaurs, and several groups of crocodilian relatives." Silesaurus, the first known member of the silesaur group was discovered in 2003. In just 7 short years, specimens of 8 other members have been unearthed from Triassic rocks across the globe. "This goes to show that there are whole groups of animals out there that we've never even found evidence of that were very abundant during the Triassic," said Nesbitt. "It's exciting because it means there is still so much chance for discovery." The name Asilisaurus kongwe is derived from asili (Swahili for ancestor or foundation), sauros (Greek for lizard), and kongwe (Swahili for ancient).